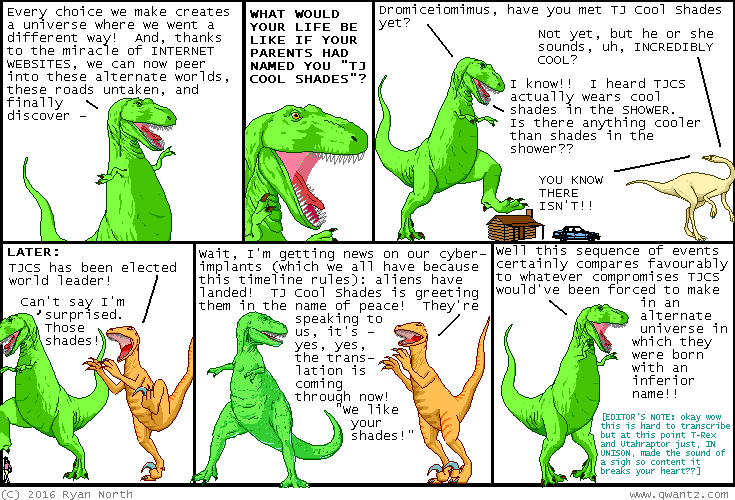 Dinosaur Comics - November 21st, 2016 - awesome fun times! –Why haven't you got a university degree yet? November 21st, 2016: I am back in Canada! Miami was great and here is a thing: it has FREE PUBLIC TRANSIT downtown. It felt so civilized it was like living in the future. Good job, Miami!! One year ago today: and yea, thus did the ancient greeks reach down to us through time and say, "we tried to warn you about The Godfather Part ]|["